So are you an American Idol watcher? I was for the longest time and then a few years ago life got busy and watching two 2-hour shows a week just got long. Plus, the auditions in the beginning had started to get annoying since they’d kind of show one disaster after another. My parents have remained fans through the years though. They’d told me to give it another shot because they do the auditions differently now. Well, with it being the least year for the show – the “farewell” season – I decided to watch. Time to say goodbye. Well as it turns out, the folks are right. The auditions are much more focused now on the talented people and their stories now. And you guys. Not only are there a lot of people who are quite talented, but the stories. They are getting me. Like, every time. I mean seriously, I’m about to burst into tears every time someone tells their story. I can’t even. I might have to stop watching. All the tears! Fortunately, these cookie cups are not tear inducing. Unless you cry when a dessert is just that good. It’s totally possible. 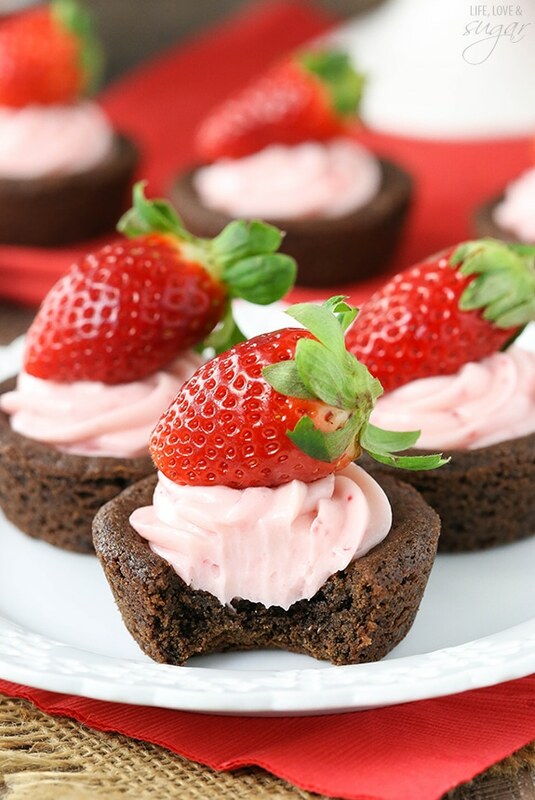 These cookie cups are a moist and chewy chocolate cookie cup that’s filled with a no bake strawberry cheesecake. 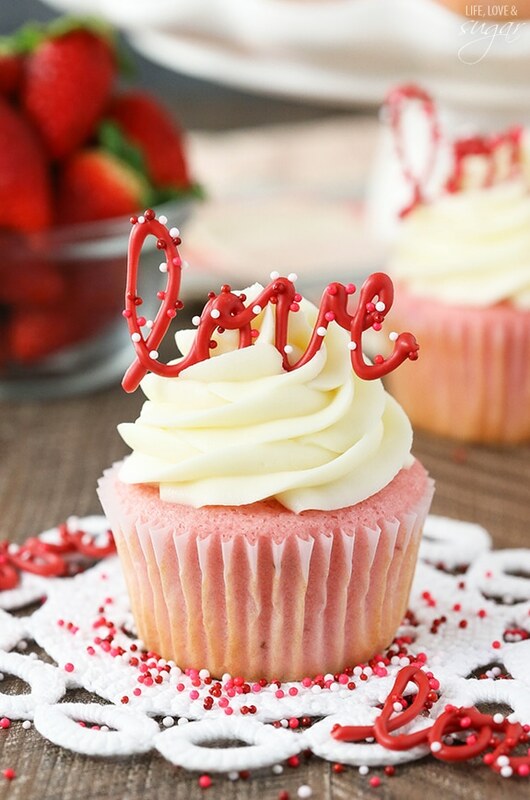 It’s a yummy flavor combo that makes me think of chocolate covered strawberries and is perfect for Valentine’s day. Cookie cups really are quite easy to make. Just make the cookie dough and bake it in a cupcake pan. I make balls of about 2 tablespoons of cookie dough each and press them into the greased pan. I spread them up the sides of the cups a bit too. They’ll puff up a little when they bake, but I use the underside of a measuring tablespoon to press down a nice lithe dome into the cookie to form a nice cup when they come out of the oven. 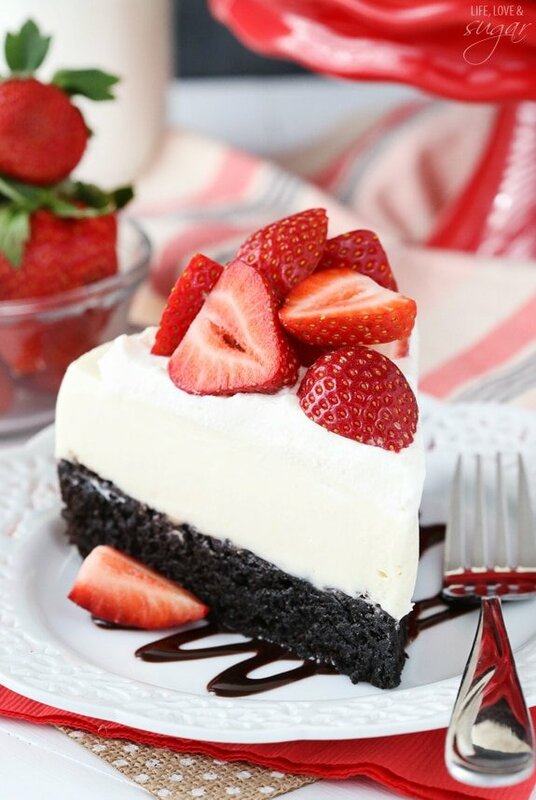 The cheesecake is of course no bake. It’s just a matter of mixing a few basic ingredients together and piping them into the cooled cookie up. Easy peasy. 8. Once cookie have cooled, make the cheesecake filling. Combine the cream cheese, powdered sugar. Add the strawberry puree a tablespoon at a time until you have the right consistency and flavor, mixing until smooth between each addition. 9. 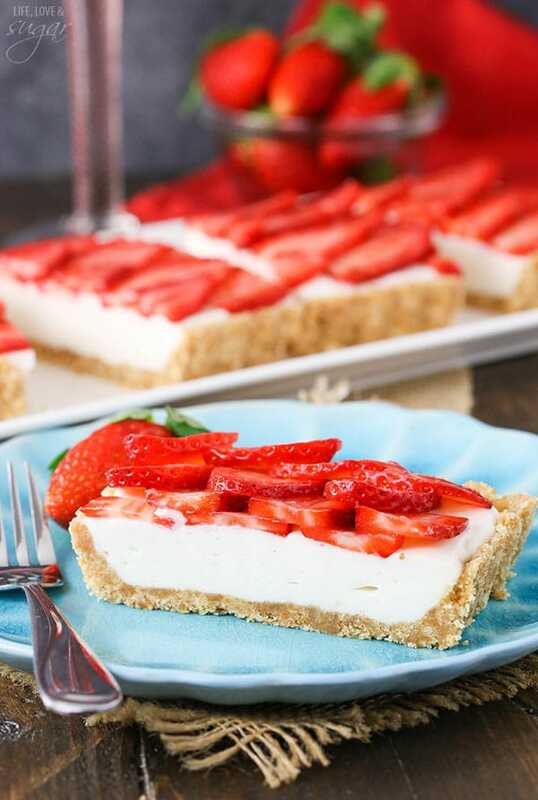 Pipe the cheesecake filling into the cookie cups and top with a fresh strawberry. Cookie cups should be refrigerated until served. I stopped watching Idol after the J. Lo years began (not because of her, just because I was tired of it), but now maybe I have to start again! I got into the Voice, too, but it’s been a while for that as well. Time to go back to Ryan Seacrest! 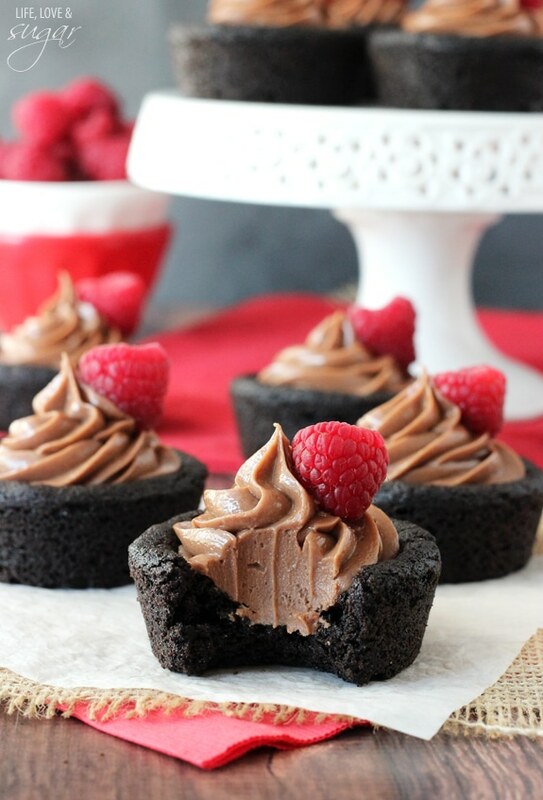 These cookie cups are so pretty! Love the strawberry cheesecake filling! I would be one happy lady if I got these for Valentine’s! I haven’t seen American Idol for year! 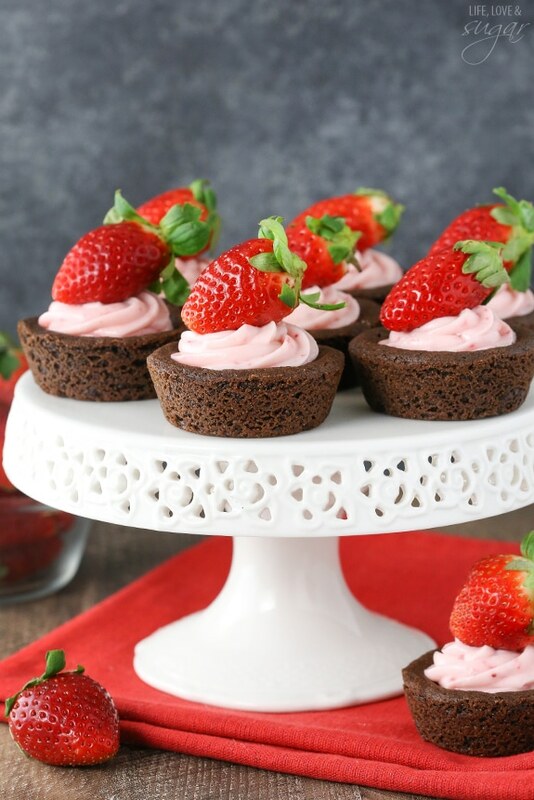 These look yummy and festive! These are so darling! I love little bite sized treats like this! 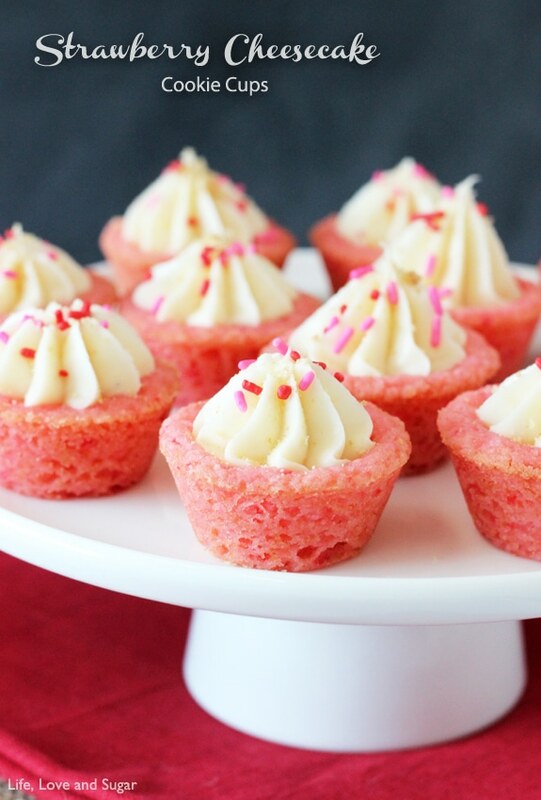 How cute are these little cookie cups! Strawberry cheesecake filling sounds like something I could eat by the spoonful. I’m with you on AI, though! I stopped watching for a bit, but there have been some pretty talented people so far. Might have to keep watching! How can you make the frosting not grainy? I didn’t have a problem with it being grainy. It should be very smooth. I’m actually in the middle making these and there no way to roll my dough into a ball. it is thick but too wet or something. Help! These look delicious! i will have to try it soon! Yes, from scratch. I just pop them in a small food processor. 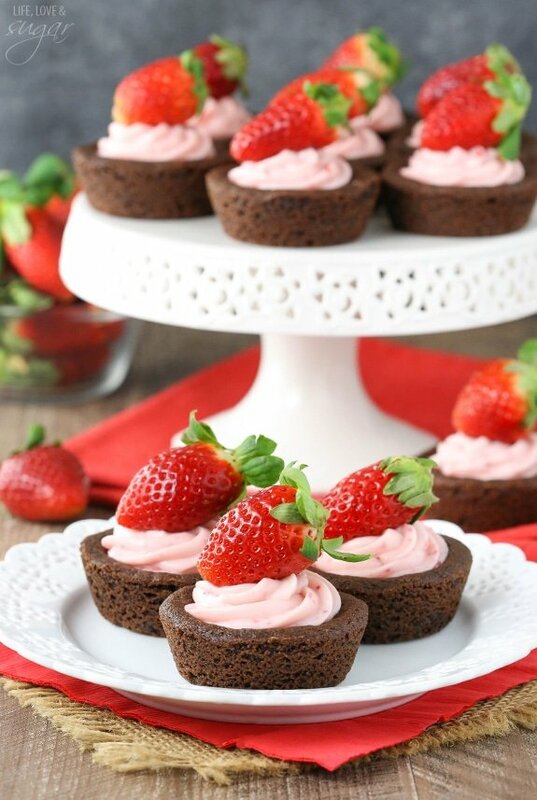 Do all of these cookie cup recipes use a standard cupcake pan or the mini cupcake pan? Unless otherwise stated, they use regular cupcake pans. 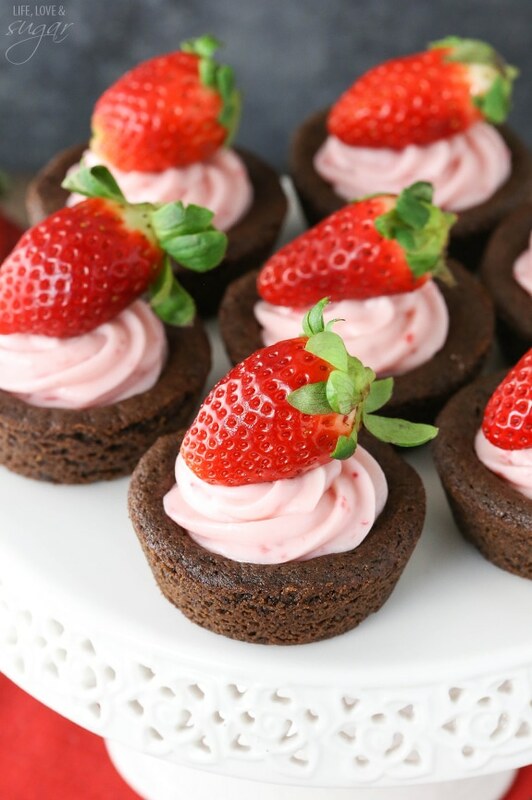 strawberry + cream cheese + chocolate = all of my favorite <3 Thanks for sharing! Gotta try this recipe at home. 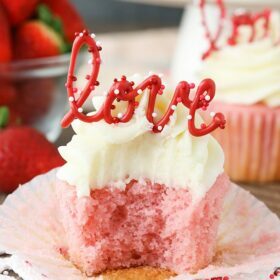 These look great and I will be making them for Valentine’s Day! Did you use salted or unsalted butter? Awesome! I used salted butter. How do you get the strawberry puree? Just pop some strawberries in a food processor and puree until smooth. Is the cheesecake filling supposed to be runny? Do I need to put it in the fridge before piping? No it shouldn’t be runny. It sounds like maybe there is a bit more strawberry puree than needed. Refrigeration should help firm it up though. If you make them again, just add the puree a bit at a time to make sure the filling doesn’t get too thin. I don’t own a blender or food processor is there a strawberry puree I can purchase as an alternative? I don’t know of a puree you can purchase, but you could try using strawberry jam or preserves. I have a few mini cookie cups that use a mini cupcake pan, but otherwise they use the standard size. I would suggest just doing the cookies and freezing them. Then finishing the rest later. Where I live now without strawberry jam, what can I use to replace strawberry jam for this great dish? Thanks! 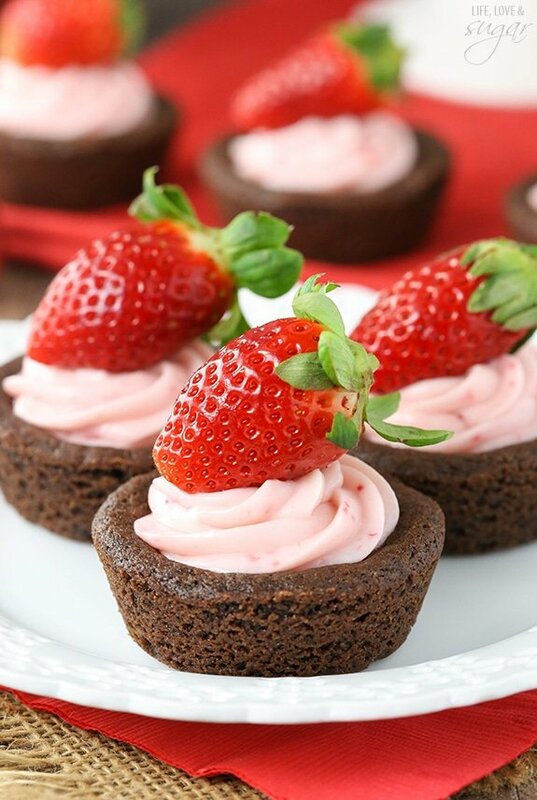 You could use a little strawberry puree. About how many brownies does this recipe make? 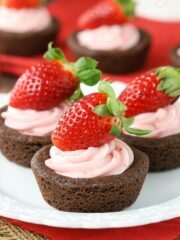 They so delicious that going making in about hour???? I tried this recipe as stated above. The Chesapeake part was runny. Should the cornstarch be in the cheesecake part instead of the cookie cups part? No, the cornstarch is in the correct place. It sounds like too much liquid (strawberry puree) was added to the cheesecake mixture. You have to be careful of that so that the consistency stays firm enough. I need to make these for my baby shower! what brand of cocoa did u use?? Can you use a brownie mix instead of the cake from scratch? 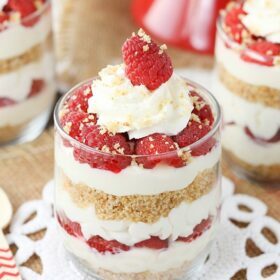 What about dehydrated strawberries blended into a powder and folded into the cream cheese mixture as an alternative to puree. It might solve the case of runny filling. Yes, you could definitely do that.